Paul Malley is President of Aging with Dignity, a national non-profit organization based in Tallahassee, Florida, with a mission to help individuals and their families receive the care they want in case of a serious illness. Aging with Dignity is the creator and distributor of America’s most popular advance directive, Five Wishes, an easy-to-use legal document – used by more 30 million people – that addresses important medical issues as well as personal, emotional and spiritual matters at the end of life. More than 14 million Americans have turned to Five Wishes as their preferred tool to make their wishes known and to discuss their preferences with their family and doctor before a health crisis. More than 15,000 partner groups (hospitals, hospices, places of worship, employers, community organizations) make up the growing network of organizations that distribute Five Wishes in communities across the country. Malley has also guided the efforts of several aging advocacy groups to improve state policy on advance care planning. He was appointed by Gov. Jeb Bush to the Florida delegation of the White House Conference on Aging, an event held once every decade to shape public policy on issues related to aging. Each day, 10,000 people turn 65. As the population ages, there are more life transitions to assist in helping clients navigate complex health and financial issues. An overlooked aspect of an advisor’s role is advance care planning – or defining, communicating and documenting healthcare wishes. Currently, less than 30 percent of adults have an advance directive. 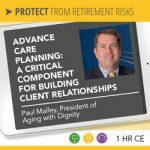 This webinar will help advisors develop skills to begin and continue these difficult conversations, use advance care planning to build an outreach and education program, and provide a step-by-step guide on completing an advance directive. How do I plan for and communicate my intentions for future medical events? As we age there are life transitions, and complex health and financial issues that we must navigate. An often overlooked is advance care planning – or defining, communicating and documenting healthcare wishes. It is important that we communicate personal, emotional and spiritual needs, along with medical and legal wishes, to your loved ones. 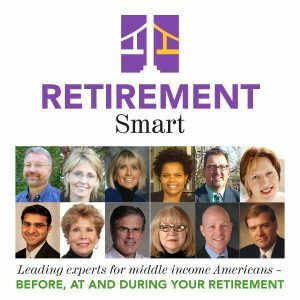 How can you BE RETIREMENT SMART? Learn more here about this nine webinar series for $89 – Risk-free for 30 days! Paul Malley and the work of Aging with Dignity have been featured in national media including the CBS, NBC, and ABC evening news, CNN, MSNBC, NBC Today Show, Good Morning America, USA Today, The Wall Street Journal, The New York Times, Newsweek, Time, and Consumer Reports. Malley has spoken about aging issues and advance care planning to organizations such as the US Departments of State and Justice, The Johns Hopkins University School of Medicine, The National Naval Medical Center at Bethesda, Florida Department of Education and Executive Office of the Governor, Delta Airlines, 3M, The National Foundation of Women Legislators, Employee Benefits Management Forum and the Alliance for Work/Life Progress. Paul Malley has a BA and Master of Arts in Communications from Florida State University. He also served an Internship at the US Embassy in London in Foreign & Commercial Service. How can you schedule Paul Malley to speak at your event? Paul Malley is an experienced speaker and presenter with a passion for providing industry-leading information to audiences. He is available to speak at your conference or appear at one of your events. Inquire here about having Paul Malley speak at your conference or event!